, a French critic and philologer, was born of protestant parents at Castres in Upper Languedoc April 6, 1651, and began to be educated in the college there; but, when by a decree of the council the direction of it was given, in 1664, to the Jesuits alone, his father sent him to the university of Puylaurens, and afterwards to that of Saumur, that he might finish his classical studies under Tannegui le Fevre, or Tanaquil Faber. 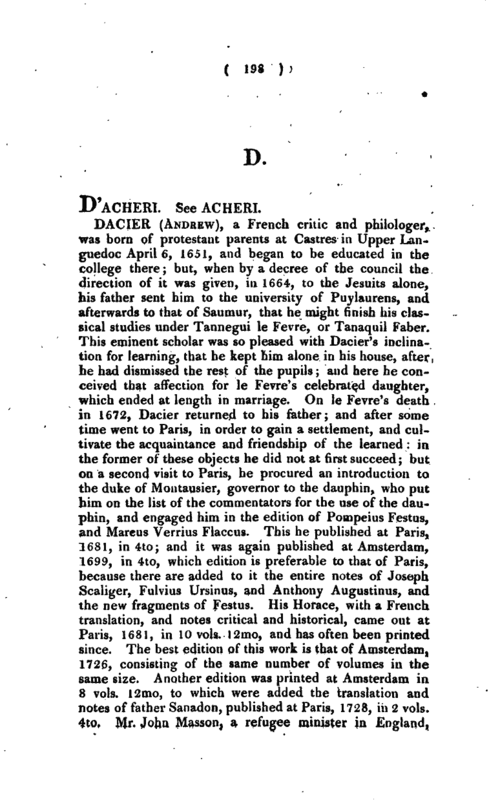 This eminent scholar was so pleased with Dacier’s inclination for learning, that he kept him alone in his house, after he had dismissed the rest of the pupils; and here he conceived that affection for le Fevre’s celebrated daughter, which ended at length in marriage. On le Fevre’s death in 1672, Dacier returned to his father; and after some time went to Paris, in order to gain a settlement, and cultivate the acquaintance and friendship of the learned: in the former of these objects he did not at first succeed; but on a second visit to Paris, he procured an introduction to the duke of Montausier, governor to the dauphin, who put him on the list of the commentators for the use of the dauphin, and engaged him in the edition of Pompeius Festus, and Marcus Verrius Flaccus. This he published at Paris, 1681, in 4to; and it was again published at Amsterdam, 1699, in 4to, which edition is preferable to that of Paris, because there are added to it the entire notes of Joseph Scaliger, Fulvius Ursinus, and Anthony Augustinus, and the new fragments of Festus. His Horace, with a French translation, and notes critical and historical, came out at Paris, 1681, in 10 vols. 12mo, and has often been printed since. The best edition of this work is that of Amsterdam, 1726, consisting of the same number of volumes in the same size. Another edition was printed at Amsterdam in 8 vols. 12mo, to which were added the translation and notes of father Sanadon, published at Paris, 1728, in 2 vols. 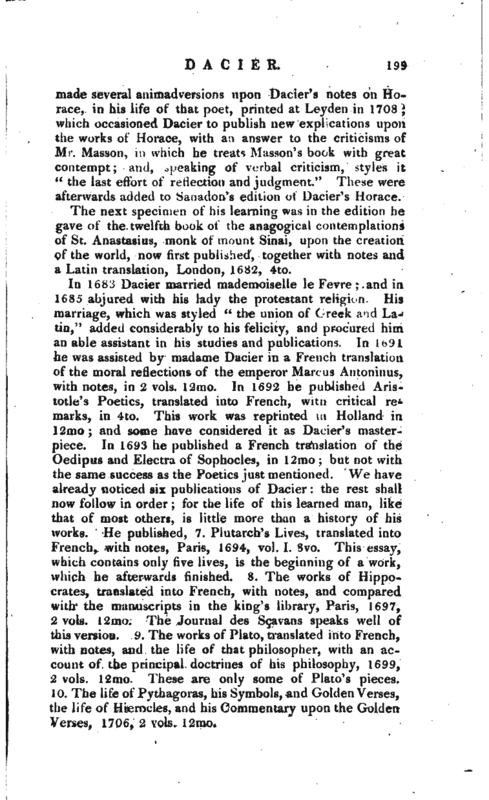 4to, Mr. John Masson, a refugee minister in England, | made several animadversions upon Dacier’s notes on Horace, in his life of that poet, printed at Leyden in 1708; which occasioned Dacier to publish new explications upon the works of Horace, with an answer to the criticisms of Mr. Masson, in which he treats Masson’s book with great contempt; and, speaking of verbal criticism, styles it “the last effort of reflection and judgment.” These were afterwards added to Sanadon’s edition of Dacier’s Horace. The next specimen of his learning was in the edition he gave of the twelfth book of the anagogical contemplations of St. Anastasius, monk of mount Sinai, upon the creation of the world, now first published, together with notes and a Latin translation, London, 1682, 4to. In 1683 Dacier married mademoiselle le Fevre; and in 1685 abjured with his lady the protestant religion. His marriage, which was styled “the union of Greek and Latin,” added considerably to his felicity, and procured him an able assistant in his studies and publications. In 1691 he was assisted by madame Dacier in a French translation of the moral reflections of the emperor Marcus Antoninus, with notes, in 2 vols. 12mo. In 1692 he published Aristotle’s Poetics, translated into French, with critical remarks, in 4to. This work was reprinted in Holland in 12mo; and some have considered it as Dacier’s masterpiece. In 1693 he published a French translation of the Oedipus and Electra of Sophocles, in 12mo; but not with the same success as the Poetics just mentioned. We have already noticed six publications of Dacier: the rest shall now follow in order; for the life of this learned man, like that of most others, is little more than a history of his works. He published, 7. Plutarch’s Lives, translated into French, with notes, Paris, 1694, vol. I. 8vo. This essay, which contains only five lives, is the beginning of a work, which he afterwards finished. 8. The works of Hippocrates, translated into French, with notes, and compared with the manuscripts in the king’s library, Paris, 1697, 2 vols. 12mo. The Journal des Sgavans speaks well of this version. 9. The works of Plato, translated into French, witli notes, and the life of that philosopher, with an account of the principal doctrines of his philosophy, 1699, 2 vols. 12mo. These are only some of Plato’s pieces. 10. The life of Pythagoras, his Symbols, and Golden Verses, the life of Hierocles, and his Commentary upon the Golden Verses, 1706, 2 vols. 12mo. | In 1695, Dacier had succeeded Felibien in the academy of inscriptions, and Francis de Harlay, archbishop of Paris, in the French academy. In 1701 a new regulation was made in the academy of inscriptions, by which every member was obliged to undertake some useful work suitable to his genius and course of studies: and, in conformity to this order, Dacier undertook the above translation of the life of Pythagoras, &c. 11. The manual of Epictetus, with five treatises of Simplicius upon important subjects, relating to morality and religion, translated into French, with notes, 1715, 2 vols. 12mo. The authors of the “Europe Sgavante of Jan. 1718,” having criticised the specimen he had given of his translation of Plutarch’s Lives, he printed, 12. An Answer to them, and inserted it in the Journal des S<javans of the 25th of June and the llth of July 1718. 13. 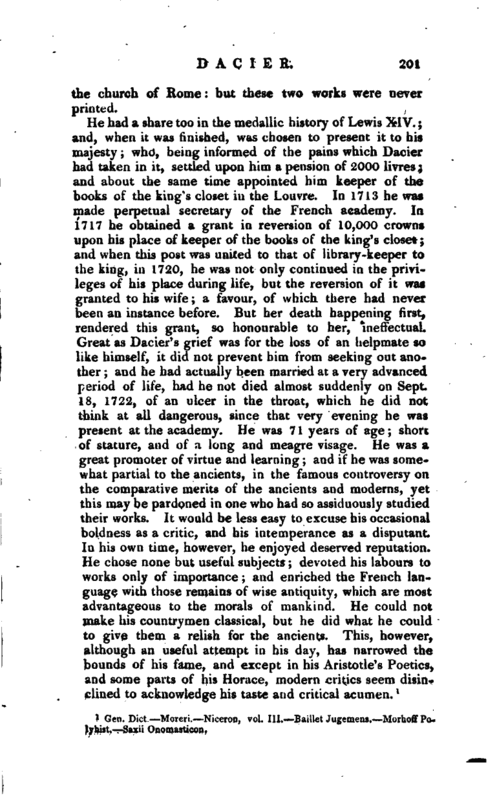 Plutarch’s Lives of illustrious men, revised by the Mss. and translated into French, with notes historical and critical, and the supplement of those comparisons which are lost. To which are added, those heads which could be found, and a general index of matters contained in the work, Paris, 1721, 8 vols. 4to; Amsterdam, 1723, 9 vols. 8vo. This work was received with applause, and supposed to be well executed; yet not so, say the authors of the Bibliotheque Franchise, as to make the world at once forget the translation of Amyot, obsolete as it is. Dacier published some other things of a lesser kind, as, 14. A Speech made in the French academy, on his admission. 15. Answers, which he made, as director of the academy, to the speech of M. Cousin in 1697, and to that of M. de Boze in 1715, both inserted in the collections of the French academy. 16. A dissertation upon the origin of Satire, inserted in the second volume of the memoirs of the academy of Belles Lettres in 1717. 17. Notes upon Longinus. 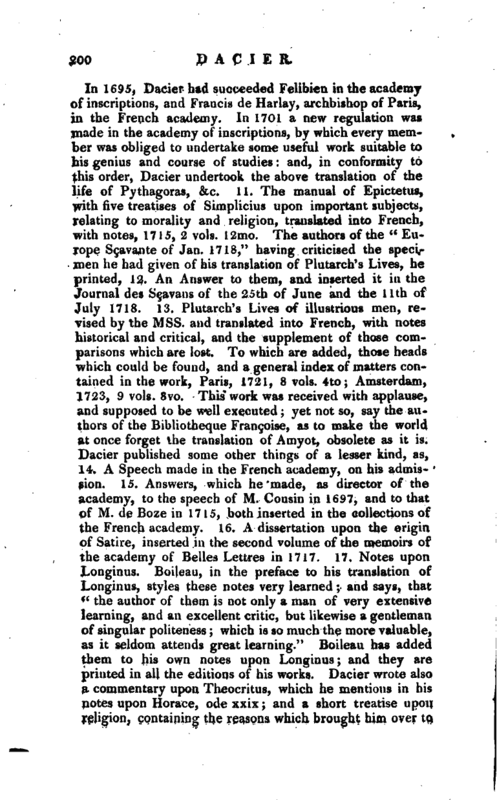 Boileau, in the preface to his translation of Longinus, styles these notes very learned and says, that “the author of them is not only a man of very extensive learning, and an excellent critic, but likewise a gentleman of singular politeness; which is so much the more valuable, as it seldom attends great learning.” Boileau has added them to his own notes upon Longinus; and they are printed in all the editions of his works. Dacier wrote also a commentary upon Theocritus, which he mentions in his notes upon Horace, ode xxix; and a short treatise upon religion, containing the reasons which brought him over to | the church of Rome: but these two works were never printed. Gen. Dict.—Moreri.—Niceron, vol. III.—Baillet Jugemens.—Morhoff Polyhist.—Saxii Onomasticon.